There was nothing easy about the West Linn girls basketball team's Friday game against South Medford. 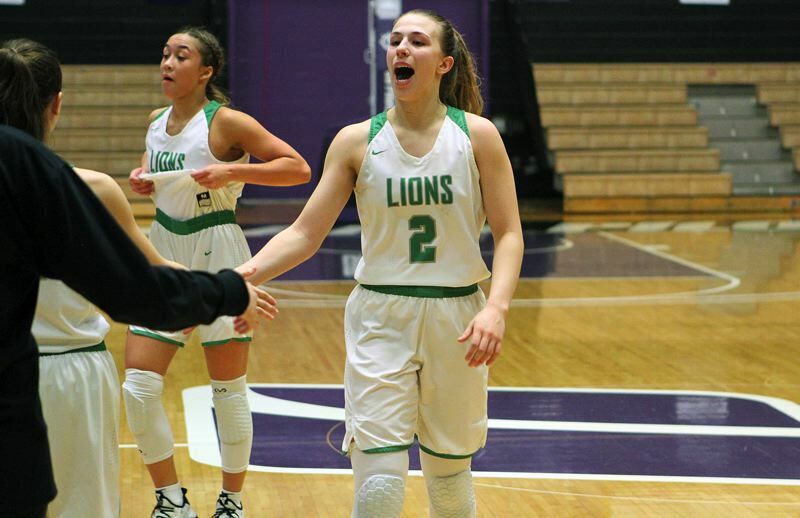 The Lions, coming off a tough 50-42 loss to Beaverton in their Thursday quarterfinal, fell behind the Panthers early on Friday and trailed by as many as nine in the second quarter. West Linn pushed ahead briefly in the third period, then led by six midway through the fourth only to see South Medford battle back and force overtime with a buzzer-beating 3-pointer before finally pulling away to win 65-56 in the consolation semifinals at the Chiles Center. "We all wanted it so bad," said West Linn sophomore point guard Cami Fulcher, who finished with 11 points, six rebounds, nine assists and one steal. "We were all tired from yesterday, but you have to dig deep and I think everyone showed up today." "I think in the first half, we came out a little slow and people were getting in foul trouble," said West Linn sophomore Payton Shelstad, who scored 15 of her 16 points in the first half (including five 3-pointers) and added six rebounds, four assists and three steals. "But in the second half, we realized that if we didn't win, we were done. I think we just fought for our seniors through the whole game, and in the second half, we realized that it was over if we didn't keep fighting." With the win, the fourth-seeded Lions improved to 21-7 overall after finishing second in the Three Rivers League. Next up, the Lions will face TRL champion Tigard in the fourth-place game at 10:45 a.m. Saturday. The second-seeded Tigers, after dropping their Thursday opener to Sheldon, beat Jesuit 45-43 on Thursday to stay alive. "It's a great opportunity even though we're not playing in the championship," said sophomore Aaronette Vonleh, who finished with 19 points, nine rebounds and two blocks. "I'm just glad we're all still playing together." "We were really bummed yesterday when we didn't get to the semis, but we've got to deal with what we've got now and we're going to try to win for fourth now," Shelstad said. In the opening quarter, the Lions struggled with turnovers (West Linn gave the ball away eight times in the frame) and fell behind 17-10 when South Medford's Tanesha Coley knocked down a 3-pointer with 20 seconds remaining. Fortunately, Shelstad buried two "3s" in the first quarter and junior teammate Elisabeth Dombrow added a 3-pointer of her own with two seconds left to keep their team within 17-13. Then, in the second quarter, the Panthers pushed their lead to 24-15 when South Medford's Shakia Teague-Perry scored inside midway through the frame. But the Lions answered impressively, piecing together a 13-4 run that tied the game at 28-28 on another Shelstad "3" with 38 seconds left in the half. Down 30-28 at the start of the third quarter, the Lions pushed ahead 38-34 on an inside hoop by Vonleh with 1:26 left in the period only to see the Panthers tie the contest 38-38 when Ula Chamberlain hit a buzzer-beating 3-pointer. It looked like West Linn would finally pull away in the fourth, pushing ahead by six points twice in the middle of the quarter, the last time at 49-43 when Vonleh took an inside pass from senior Katie Schoenborn and scored with 3:38 left in the period, but the Panthers weren't done yet. Chamberlain hit twice from the field down the stretch, Bella Pedrojetti connected once and Teague-Perry did the rest, scoring five points, including a buzzer-beating "3" from the top of the key in the final second, to force overtime at 54-54. There, finally, the Lions left the Panthers behind for good. While South Medford went 0 for 7 from the floor in the extra session, the Lions got two baskets from Vonleh and 3 of 4 free throws by Fulcher to pull away. "Our bench was awesome, everyone played so hard," Fulcher said. "We played so hard and we wanted it more." "We didn't really realize how much we wanted to win until it got into the last couple of seconds and it was a really close game and then into overtime," Vonleh added. "I think once we were all on the same page, that's when things started going our way." For the game, Dombrow added 14 points, 11 rebounds and two assists. For South Medford, Chamberlain had 24 points, two rebounds and two assists, and Teague-Perry added 11 points, five rebounds and two steals.